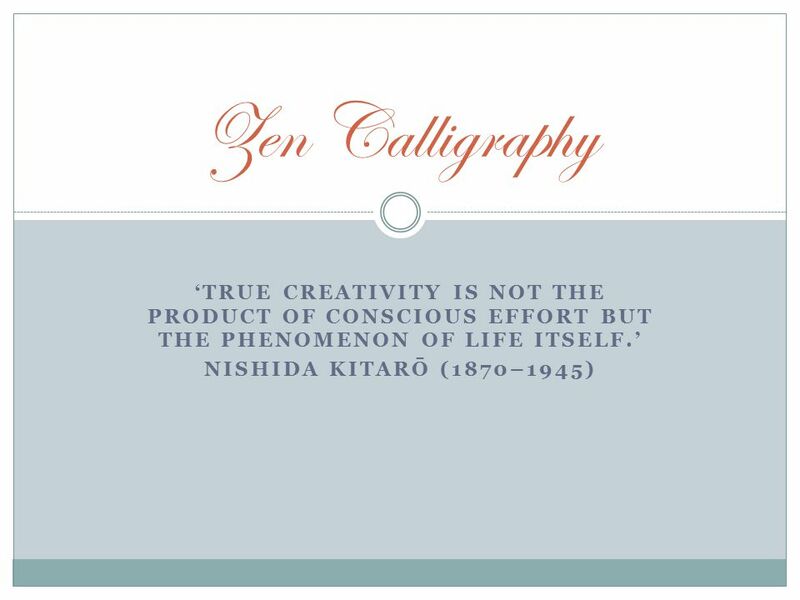 ‘TRUE CREATIVITY IS NOT THE PRODUCT OF CONSCIOUS EFFORT BUT THE PHENOMENON OF LIFE ITSELF.’ NISHIDA KITARŌ (1870–1945) Zen Calligraphy. 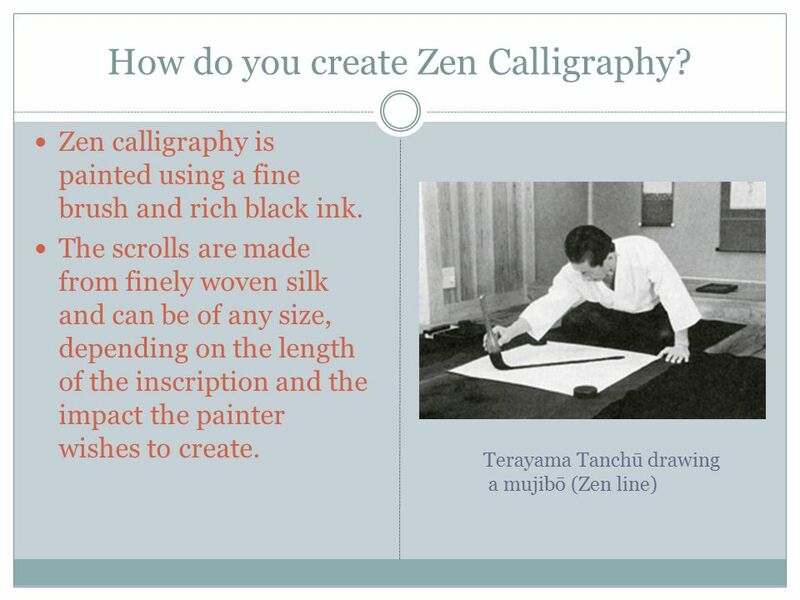 2 What is Zen Calligraphy? Zen calligraphy springs from ‘shonen sōzoku’, a Buddhist term equivalent to ‘true thought’. Although the hand of the artist can be seen in any work of art, it is the sho – the brushed calligraphy itself – that is the real artist. True creativity through calligraphy arises from ‘mushin’, or the state of ‘no-mind’, which lies beyond thoughts, emotions and expectations. 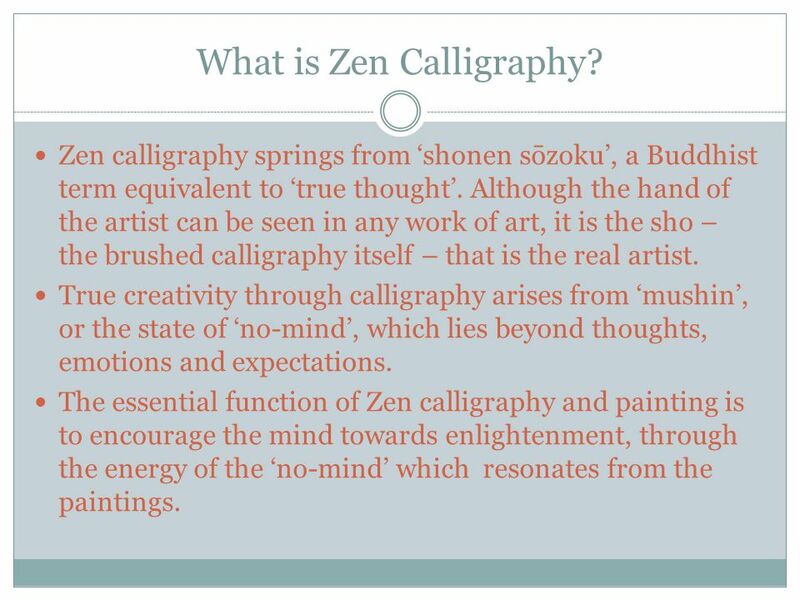 The essential function of Zen calligraphy and painting is to encourage the mind towards enlightenment, through the energy of the ‘no-mind’ which resonates from the paintings. 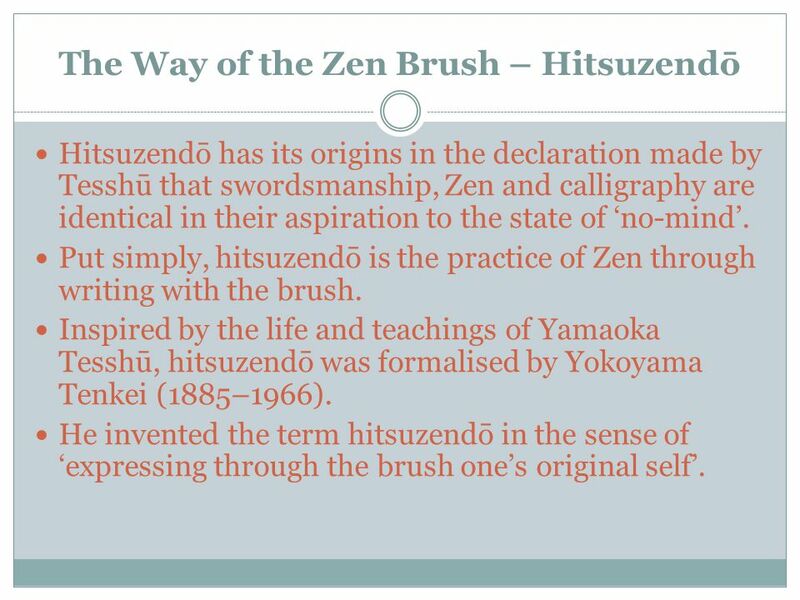 4 The Way of the Zen Brush – Hitsuzendō Hitsuzendō has its origins in the declaration made by Tesshū that swordsmanship, Zen and calligraphy are identical in their aspiration to the state of ‘no-mind’. Put simply, hitsuzendō is the practice of Zen through writing with the brush. Inspired by the life and teachings of Yamaoka Tesshū, hitsuzendō was formalised by Yokoyama Tenkei (1885–1966). He invented the term hitsuzendō in the sense of ‘expressing through the brush one’s original self’. 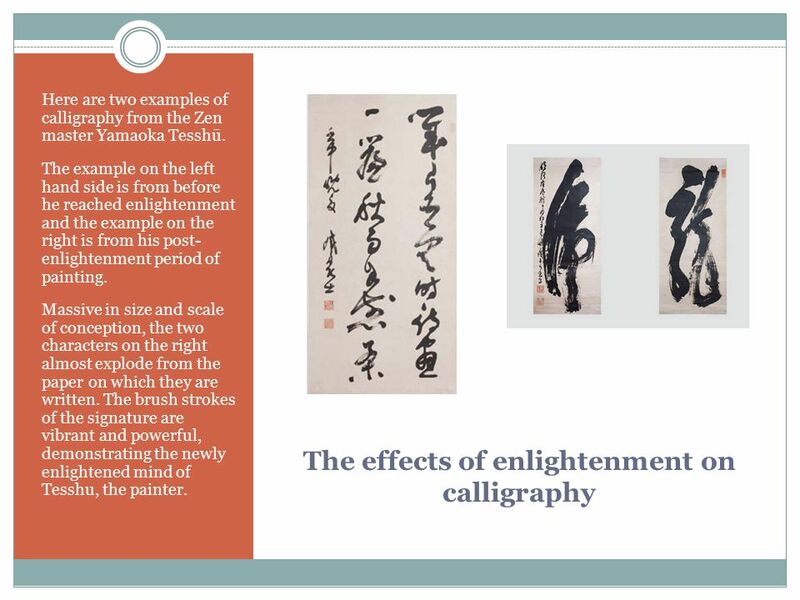 5 The effects of enlightenment on calligraphy Here are two examples of calligraphy from the Zen master Yamaoka Tesshū. The example on the left hand side is from before he reached enlightenment and the example on the right is from his post- enlightenment period of painting. Massive in size and scale of conception, the two characters on the right almost explode from the paper on which they are written. The brush strokes of the signature are vibrant and powerful, demonstrating the newly enlightened mind of Tesshu, the painter. 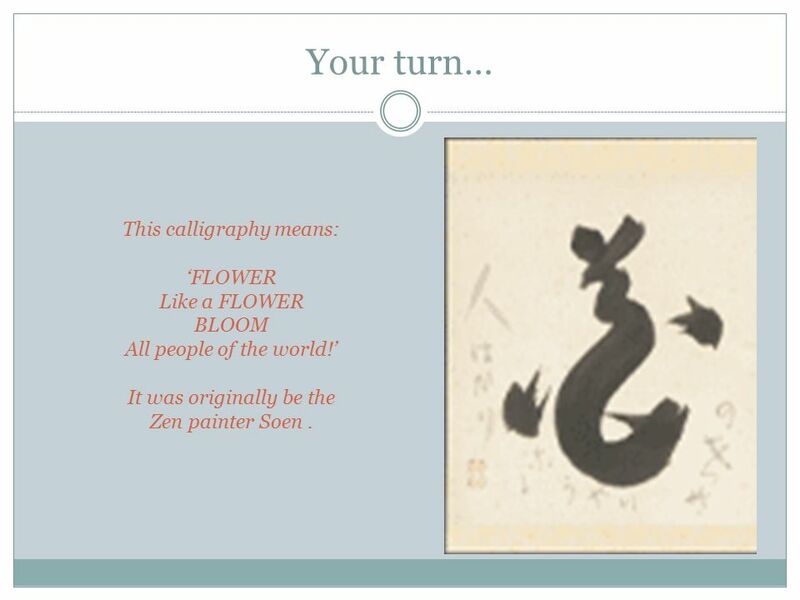 7 Your turn… This calligraphy means: ‘FLOWER Like a FLOWER BLOOM All people of the world!’ It was originally be the Zen painter Soen. Download ppt "‘TRUE CREATIVITY IS NOT THE PRODUCT OF CONSCIOUS EFFORT BUT THE PHENOMENON OF LIFE ITSELF.’ NISHIDA KITARŌ (1870–1945) Zen Calligraphy." THE ILLUSIVE PRESENT MOMENT: DOES IT ESCAPE YOUR GRASP? Prof. Thomas Maher March 2, 2013 English Tao Class Kuang Ming Saint Tao Temple. Calligraphic Writing The meaning of calligraphy is beautiful handwriting. It means a special writing and it has its own aesthetic rules. It is different. Munch Museum Works from the collection. The Scream 1893. Calligraphy means ‘Good Writing‘ or ‘Beautiful Writing. Chinese calligraphy is an art form, and calligraphers are highly respected. There are several styles. Japanese Art, Architecture, Poems & Plays. Art & Architecture Japan borrowed artistic ideas from China and Korea Japanese artisans made many things with. Sumi’e Painting Ink painting has evolved from the elegant Calligraphy of China. The stroke that forms the character for number one, becomes the trunk and. A) An Indian Buddhist who took the Zen method to Chan. Founder and first patriarch. Studio Art Daily Plans Nov 12-15, 2013 Ms. Livoti. COMPOSI TION is the arrangement of The 7 Elements of Art in a work of art. Martin Buber on Dialogue in Education and Art. By: Shtelman Rina The Kaye Academic Educational College. 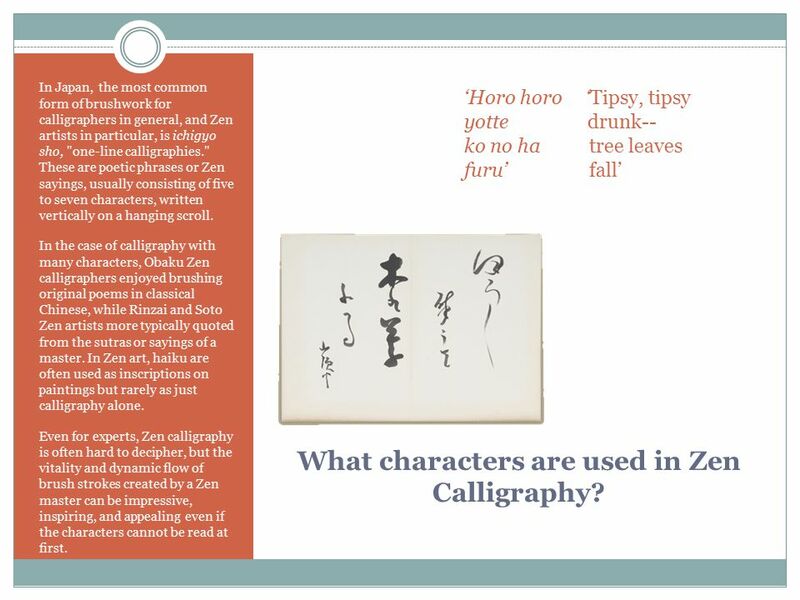 “Chinese Calligraphy” History and Technique Compiled by Robert Ponzio Oak Hall School. Chinese Music, Dance And Art. Corea Japan China WeiqiGoBaduk. The Go is one of the oldest board game in the world. Its true origins are unknown, though it almost certainly originated. Murray Avenue School Art Appreciation Spring 2014. Shodou ’The Art of Writing’ By Ella Rose. History of Shodou- Shodou is the Japanese word for Calligraphy, it’s translation meaning ‘the art of writing’. Chinese Calligraphy. Calligraphy,literally “beautiful writing”,is one of the traditional four arts dating back to the earliest days of Chinese history. 2013-14 Studio Art Daily Plans Nov 12-15, 2013 Ms. Livoti.